One of our latest restoration projects includes this Colt Bisley that started life back on June 5th, 1903 when it was shipped to Hibbard, Spencer, Bartlett & Company in Chicago, Illinois. Our customer is an amateur collector of firearms with a newfound love of the Bisley Model. This is the fourth firearm that we have restored for him – others have included a 1st Generation Colt SAA, a Colt 1911 manufactured in 1914 that was carried by a relative of his in WWI, and the third a Colt Bisley. 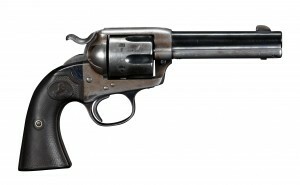 Bringing this Colt Bisley back to its original condition (with the addition of fancy walnut grips) will include a new barrel, cylinder, cylinder bushing and base pin, and new two piece fancy walnut grips. We will fit and polish all parts, restore all markings and then apply our signature color case hardening, charcoal bluing and nitre bluing on the appropriate parts. Currently the gun being fit for those fancy walnut grips… Stayed tuned for another update as well as more pictures.